I had a really fun weekend. And by weekend, I mean Sunday. 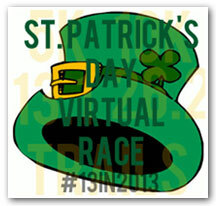 Thankfully by Sunday I was feeling much better, so I decided to tackle the St Patty's Day virtual race. As far as I can tell, there is no specified distance for this virtual race, so I attempted to push myself with a 10K. I'd been pretty crampy (TMI??) the day before, so I wasn't sure how it would go. Plus, I decided to do a 5K route twice instead of mapping something new. This is usually too mentally difficult for me, but it would allow me to end after a 5K if I needed to. I DIDN'T! In fact, continuing and starting the route over seemed like just about the most natural thing ever. Woot woot! There was a brief moment about 43 minutes in that I started to hit a small wall, but I jumped right over that mother and crushed it. I'd never run a 10K in under an hour, so in the back of my mind that was my goal. My previous PR was 1:04:54. Virtual races totally count for PRs, right? :) The best part? I didn't even feel like I was pushing it all that hard - even though I did get super sweaty. I even had enough energy left over to finish my 7-Day Arm Challenge, and bike to a spring training game - about 5 miles from my apartment. I started this run a bit lot later than I really should have, so we ended up leaving for the ball game later than we'd hoped. In fact, by the time we hopped on our bikes, the game had already started. Oops! We're not die hard baseball fans by any means, so it wasn't really a big deal to us that we didn't get to the game until the 3rd inning. You can't really tell from the picture, but we were watching Cubs vs Rangers. It was a fun game. Sorry to all you Cubs fans out there, but they really didn't seem to bring their A-game. Both teams, actually, didn't seem to be very alive out there, but the Rangers at least seemed to be a little more awake. They didn't have any, but they did have Ben & Jerry's. It would have to do. LOL. 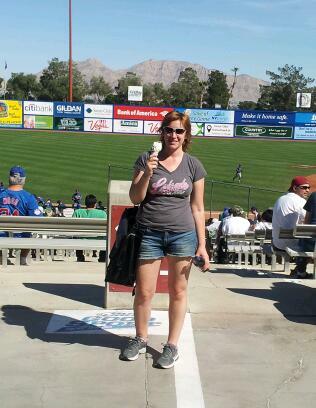 The final inning was probably the most exciting! The score was 8-5 Rangers and the Cubs were up to bat. Bases were loaded. Two outs already on the board. Any running or biking or baseball for you? Virtuals totally count for PRs if you ask me. As long as you did the 10k it's a 10k PR. Looping a shorter route can be boring, but it can be a lifesaver if you need to get home quickly when things go wrong (either with oneself, or back at home)! Thanks! Usually looped courses get me because as I cross the 5K line, mentally I just think I should be finished. I was pretty happy that I got past that for this race. Woohoo, look at you and your speedy 10K time! That's awesome! I know, right?! I still have such a hard time believing it's me and I'm not dying!! Yay for the PR! It counts in my book! Woohoo! Congrats on a new PR! Thank you so much for your comment AND you can totally give yourself props for the virtual race PR!!! Congrats. I'm doing my first 10K April 6. I've done 5Ks and half marathons, but never the 10K distance. We have 4 more virtual races planned and no there isn't a set distance. It's up to the runner. Info will be posted on FB, my blog and a newsletter. Even though I'm nearly 4 months late to the party, I'm happy to join the 13 in 2013 party. :-) I'll keep my eyes open got the updates. Woohoo! You're so fast! Congrats! !